If you're just collecting exits this is by far the easiest level to beat. The goal tape is right in front of you! However, you will probably want to get a yellow Yoshi. To do so, grab the yellow baby Yoshi and feed it the Spinies that Lakitu throws (or, alternatively, the blue blocks) until it grows up. There's a silver P-Switch at the very beginning. If you step on it, Lakitu will start throwing silver coins. With some luck, you can get a 1-up this way. Be careful with that Y button! You're standing on a thin layer of blue blocks, and it's too easy to accidentally grab one and fall to your doom. The secret exit is located at the very top. The key is hidden in the question block at the left, the keyhole is at the right. To get there, you will need to knock out the Lakitu with one of the blue blocks. 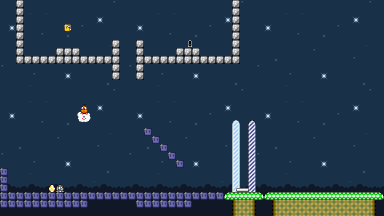 Since you'll need to be able to reach his cloud, do this either at the very beginning (where there is a small pile of blocks you can jump from) or use the sort-of staircase near the end. Jump in and float up to reach the key and keyhole. Of course, Cape Mario can just get some momentum and fly straight up himself. There are no Dragon Coins in this level. This page was last edited on 10 September 2015, at 15:12.